Dimension width-17" length -13" Strap-9"
Hand made cotton block print tote bag .This bag have traditional Indian print .This bag have multipurpose usage like for shopping , outdoor activity , for holiday . Measurements:Bag width (side to side): 17 inch / 44cm. Bag length (up to down): 13 inch / 33cm. 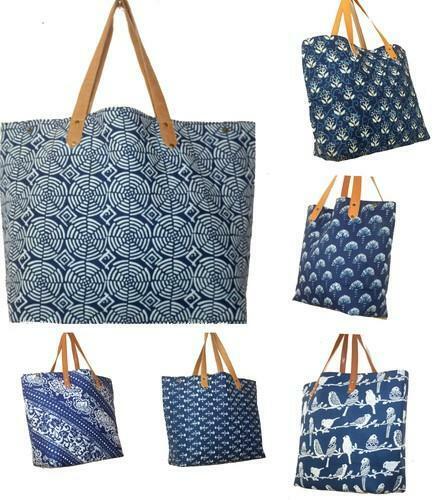 Size width-17" length -13" Strap-9"
Hand made cotton block print tote bag .This bag have traditional Indian print .This bag have multipurpose usage like for shopping , outdoor activity ,for holiday . Top handle length- 9 inch / 23cm. This bag has two pocket inside for your keys ,mobile & purse . The bag is adjustable you can make smaller & bigger . Packaging Details each item pack in poly packging. We “Bhawana Handicrafts” founded in the year 2012 are a renowned firm that is engaged in manufacturing and exporting a wide assortment of Banjara Bags, Ladies Kurti, Kantha Quilt, Kani Shawl, Mandala Tapestry, Ladies Shawl, Mandala Bed Sheet, etc. We have a wide and well functional infrastructural unit that is situated at Jaipur (Rajasthan, India) and helps us in designing a remarkable collection of products as per the global set standards. We export these best-in-class products to all over the world. We are a Sole Proprietorship company that is managed under the headship of "Mr. Sanjay Maheshwari" (Owner) and have achieved a significant position in this sector.